Three Cheers Summer Pale Ale | Three Cheers Pub Co.
Just like we knew we wanted to open pubs, one day we knew we wanted to brew our own beer. The launch of the Three Cheers Pub Co. gave us an excellent opportunity. We wanted the beer to stand for everything the pubs did. It needed to celebrate British produce and be brewed in London. It needed to have its own unique charm and most of all it needed to be something wonderful to drink with your friends on lovely, long summer days. Introducing the Three Cheers Summer Pale Ale, this season’s must have drink. Produced exclusively for by our friends at The London Beer Factory, the result is a light, refreshing pale ale with a citrus aroma. We tirelessly tasted over a few months to make sure we got it just right too, so we hope you like it. Three cheers for summer, beer and great company. Until July, Three Cheers Summer Pale Ale will be just £3 a bottle or pint (see what we did there), Monday – Friday before £7 or £3.75 at all other times. If you’d like to win an entire case, follow us on Facebook and Twitter. 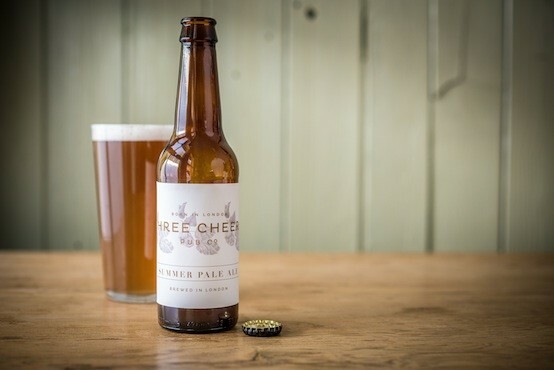 Three Cheers Summer Pale Ale is available at all Three Cheers pubs whilst stocks last. If you’re more of a wine and cocktail fan, don’t forget to try our Three Cheers red and white wine and cocktails, available at every pub. If you’d like to find out more about our new products and special offers click here.